In this Feb. 9, 2018, file photo, a radiology technician looks at a chest X-ray of a child suffering from flu symptoms at Upson Regional Medical Center in Thomaston, Ga. Under a recent federal rule from Centers for Medicaid and Medicare Services, hospitals are required to post their price lists online. Hoping to learn who might offer the lowest price, you run searches at four nearby hospitals using the newly available data. Just to be safe, you search for "X-ray," "xray" and "X ray." That's when you find out that comparing prices isn't going to be as easy as it sounds. UPMC Pinnacle Harrisburg's spreadsheet lists "XRAY CHEST 2 VIEWS" for $185. It also lists "X-RAY EXAM; CHEST 1 VIEW" for the same price. A search on Penn State Hershey Medical Center's online tool yields dozens of entries, including four that begin "CH X-RAY," with prices ranging from $576 to $7,441. Penn-affiliated Lancaster General Hospital's spreadsheet offers something called "HC XRAY GUIDANCE" for $446. It shows no listings for chest X-rays, though. WellSpan York Hospital's spreadsheet doesn't yield any listings. Maybe you think to broaden your search with the term "radiology," which is the name for the department where you'd get an X-ray, or "fluoroscopy," which is a procedure that uses X-rays to get moving images. At this point, though, all but the most dogged of consumers might have abandoned this effort.U.S. Health and Human Services Secretary Alex Azar has said the the newly public data will help consumers shop around for health care and will increase competition among health systems. However, early reports indicate the price lists are virtually incomprehensible to people shopping for competitive prices. In part, that's because the lists are what industry professionals call "chargemasters," which hospitals use to negotiate with insurers and are typically higher than what a patient pays. While the new data may not have immediate value to consumers, it is shaking up the health care industry and stoking discussion around price transparency in a way that some say could ultimately drive down costs. People trying to get an estimated cost for a health care procedure are better off contacting pricing experts at the hospital, said Dan Angel, Penn State Health's vice president of revenue cycle. "We really don't feel that the raw data about the charges are going to be very useful to the health care consumer, and in fact, that may be downright confusing in some cases, because, again, these are the standard charges, and frankly, there's no standard patient," Angel said. When a person goes to the hospital for treatment, the services and procedures they get will be based on their individual needs, said Jolene Calla, vice president of health care finance and insurance at Hospital and Health System Association of Pennsylvania. Someone who isn't a medical billing professional would have no idea what services would be bundled together on a bill. Additionally, prices shown on chargemaster lists are reduced through contracts between health systems and insurers, Calla said. The money a patient owes for a copay and deductible has little to do with the number shown on a price list. Even cash-paying patients often can negotiate a lower price with the hospital, Calla said. "So those are two very different numbers," Calla said. "Charges are average estimates, list prices -- the most that can be billed. They do not tell you any individual cases of what you might actually have to pay for your care or service." 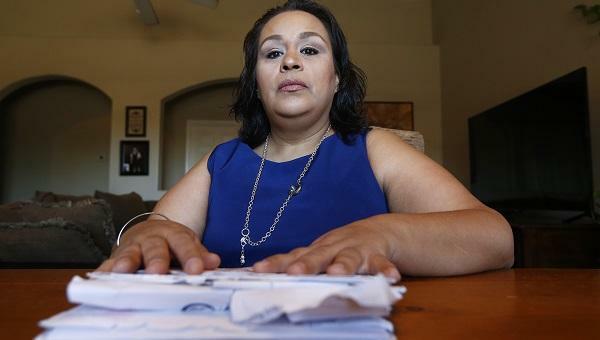 In this April 13, 2018, photo Josephine Rizo sits in her home with her stack of bills from her ongoing battle with cancer in Phoenix. At Robert Wood Johnson Foundation, senior program officer Andrea Ducas said some people still may seek out hospitals that have lower list prices because they think they'll end up paying less. That's especially true for patients paying cash. "If you're anchoring your negotiations with a very high starting number, you're still going to get to a high concluding number," Ducas said. However, as the search results for an X-ray showed, those who may be tempted to compare chargemaster prices from one health system to another will have a hard time finding comparable results. More complex procedures yield more confusing results. Here's a look at prices for giving birth at the same four hospitals. UPMC Pinnacle Harrisburg has an entry called "VAGINAL DELIVERY" for $4,852. WellSpan Health has something called "HC DELIVERY CHARGE" with a $3,389 price tag, but also something called "HC OB RESIDENT VAG DELIVERY ONLY" for $1,555, as well as "HC OB RESIDENT VAG DELIVERY VBAC" for $1,560. At Lancaster General an "HC VAGINAL DELIVERY" is $3,282. There's also something called "HC VAGINAL DELIVERY PACKAGE" for $2,175. Penn State Hershey lists "VAGINAL DELIVERY ONLY" for $2,065 and "Delivery -> vaginal" for $1,749. At WellSpan Health, spokesman Ryan Coyle said the "HC delivery" charge is the "hospital charge" and doesn't account for additional charges from the doctor. "When a baby is born, there of course is a professional/physician that delivers that baby," Coyle said in an email. "The professional/physician has their own charge beyond that $3,389 facility charge. This is common. It comes as a separate bill from that physician and professional charges do not show up in any chargemaster of any health care system; only facility charges." However, when a medical resident at the hospital delivers a baby, the hospital is billed an additional $1,555 in lieu of the doctor's cost, Coyle said. He noted that WellSpan York is a teaching hospital, and residents do deliver babies "from time to time." "An example like this is why we feel the chargemaster can complicate matters and not give a true indication of cost," Coyle said. "We suggest patients get an estimate for the potential cost to them using the form or the telephone number on our website." Ducas said making the chargemaster lists public may not immediately help people who are trying to shop around for lower prices, but it is a step toward price transparency. She said making those prices available allows insurance commissioners and watchdog groups to flag hospitals that are charging exorbitant amounts for a service when compared to neighboring hospitals. In the long run, that could lead to patients paying less. "You might start to see changes in behavior, because organizations or institutions don't want to look bad, they don't want to look like the guys that are that are charging way too much for a service when down the street, somebody can ... get a service at the fraction of a price," Ducas said. But she agreed with health system officials on one point: The average person -- or even an expert like her -- will have more success determining cost of care by contacting individual hospitals to get price estimates, rather than sifting through the chargemaster lists. "If you have insurance, you're going to want to call to get a price on it, because what your insurance is paying for something, it's going to be unique to you. And if you're uninsured, and you're a cash-paying patient, usually there are steep discounts on that as well." As a note of disclosure, Transforming Health receives financial support from WellSpan Health. Find this report and others at the site of our partner, Transforming Health, by WITF. A conversation with writer and filmmaker John Miller about his and David Bernabo's new film about Moundsville, W.V. When Americans talk politics these days, it’s almost impossible to avoid the subject of President Donald Trump. And that can be a problem. A five-term Republican congressman who co-chaired Donald Trump's successful presidential campaign in Pennsylvania is resigning. Tom Marino said in a statement Thursday that his last day will be Jan. 23 and that he's taking a job in the private sector. The 66-year-old Marino is a former county and federal prosecutor who co-chaired Donald Trump's successful presidential campaign in Pennsylvania. He easily won re-election in November to his heavily Republican district in northern Pennsylvania. Some local feminist activists say a fundraiser to bring a large balloon depicting President Trump as a baby to Pittsburgh's Women's March reveals a larger division between feminists in the city.